This year’s annual State of the News Media, put together by Pew, is a comprehensive look at the entire media world. 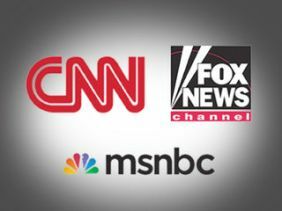 But let’s take a look at the cable news section – and the all-important race between Fox News, CNN and MSNBC. In one key demographic — 25-to-54-year olds — CNN fell behind a more ideological MNSBC in prime time audience, a prospect unthinkable even two years earlier. For the first time in years, CNN also cut back on newsgathering, its primary competitive advantage over its rivals. Fox surpassed CNN in profit and revenue, as well, and was closing in fast in the amount it can charge for advertising per thousand viewers, after years of having to discount the price of its ads. 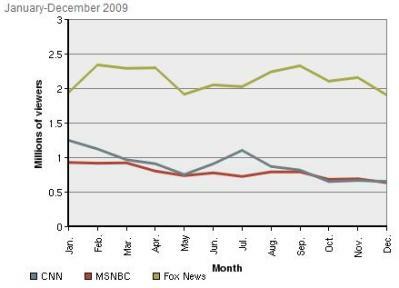 CNN and HLN remained static, not necessarily a bad thing given the challenges facing other media in 2009. Profits (up 1% to $475.5 million) and revenues (down 1% to $1.18 billion) were basically flat, as was overall news investment (down 2.5% to $703.4 million)…. [FNC’s] profits (up 19% to $534.8 million) and revenues (up 14% to $1.21 billion) grew substantially. The channel’s news investment was up 10% to $674 million…[MSNBC’s] profits rose 1% to $149.6 million, on revenues that were similar, up less than 1% to $368 million. As a consequence, MSNBC is expected to have spent roughly the same amount, $217.9 million, on newsgathering in 2009 as a year earlier. In other words, CNN, HLN, MSNBC – flat. FNC – up big. In 2009 CNN was the leader among the three cable news brands according to Hitwise, one of the major Web audience measurement companies. Its site, CNN.com, was relaunched in the fall, and registered even more traffic in the months following. Yeah, not really a race anymore is it?